Huntington City Council has passed an ordinance that will bring the city's landbank authority into compliance with state mandates though the Home Rule enacted procedure does not sunset until 2019. City Attorney Scott Damron told the work session that he drafted a new ordinance that "completely redid" the old one, specifically board memberships and the cap on first tax lien refusal. The Land Bank Fast Track authority will be separated from the Huntington Urban Renewal Authority. This will allow city employees with experience bringing property back to productive use to serve on the Fast Track board. In addition, the city's first refusal right on property tax tickets will be capped at $25,000. Owners have 18 months to redeem the property. After that time frame, the land bank has the option to sell to housing developers, work a deal with adjacent property owners, or join it to other vacant , unsafe properties for demolition and redevelopment. Council authorized an application for free training, technical and design assistance from the WV Development Office . Bri Shell, planner, explained that the application is for an ON TRAC community in the West End with participation from River to Rail, Unlimited Futures, and the neighborhood association. Ms. Shell said the revitalization training at a to be determined location, if the city is selected. Applications "opened in January and hopefully we are on track to be a designated community." If awarded, Ms. Shell indicated training will be "implemented in the Spring." Council approved and participated in a ceremony that designated the city a Purple Heart City, which honors veterans that have been wounded and awarded the medal. 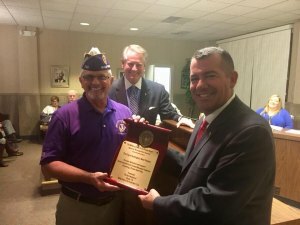 The Ohio Military Order of the Purple Heart had inquired about honoring veterans with the designation. Council members authorized a resolution for a memorandum of understanding with the Cabell County Stop Team and the Huntington Police Department. The funding supports overtime for service of domestic violence petitions. Scott Lemley, the executive director of the city's Department of Planning and Development, explained the first reading of an ordinance to allow Marshall University "club" teams (i.e. rugby, cricket ) to use A.D. Lewis Field for a $500 a month rental. Under the terms, MU teams can not override use by the community's children.